With the original 1960, square shouldered Hummingbird seen many times in the hands of The Rolling Stones guitarist, Keith Richards, and then later with the likes of Noel Gallagher, Sheryl Crow, and Kid Rock its not surprising that this model has stood the course. Bringing it up-to-date, but retaining the elements that saw its predecessors become so popular, the Epiphone Hummingbird Pro Electro Acoustic brings you a guitar with a sweet, balanced tone but with the power to fill any stage. A complex tonewood that improves the more you play it, its only fitting that solid spruce was the wood of choice for the top of this performer’s instrument. Opening up the tonal palette of the Epiphone Hummingbird Pro the top is joined by a select mahogany body. Of course lying atop the guitar’s faded cherry burst finish is the classic Hummingbird/flower tortoise shell style pickguard. Matching this is select mahogany neck, carved to the SlimTaper D profile, which has been glued-in with a dovetail joint. Topping this is a 20 medium fret, rosewood fingerboard with a 12" radius, pearloid parallelogram inlays, and a 1.68" nut. The fingerboard also sports a single ply white binding, joined by the same on the back of the guitar’s body, and a 5-ply white & black binding on the top. The headstock of the Epiphone Hummingbird Pro features the classic slope Dovewing design and is adorned with the Epiphone logo in white. Down the other end of the guitar lies a reverse belly rosewood bridge, with a compensated saddle, keeping action and intonation smooth. 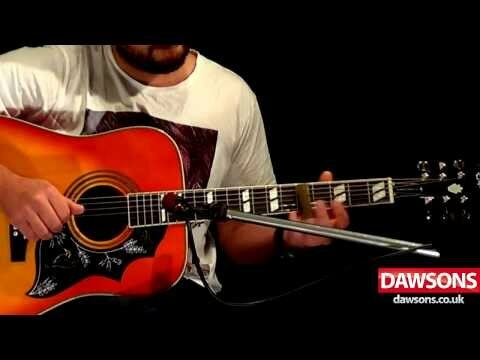 The result of a partnership that has flourished for over ten years, Epiphone and Shadow Germany have ensured the acoustic sound of the Epiphone Hummingbird Pro Electro Acoustic is heard even when amplifying it to large audience. As well as being effect, the Shadow ePerformer preamp and Shadow NanoFlex pickup system are also physically discreet, with the pickup lying under the guitar’s saddle and the preamp only just visible on the upper bout. The Shadow ePerformer Preamp offers a selection of controls, with a Master Volume, Treble and Bass EQ, Mute, and a Dynamics control all available from the guitar alongside a low batter indicator. Posted on 19/12/2018 by Adam k I got this guitar when i was a below average guitarist and, after playing this guitar, it unlocked a whole number of new potentials for playing, as i was used to playing a travel guitar. Have and would recommend this guitar, and is well worth the £250 pounds you pay for it. 10/10 to look at with and amazing pick guard design. never had a guitar that catches peoples eyes as much as the hummingbird. Has the quality of the Gibson for almost 1/10th the price. Posted on 28/10/2016 by Gibbo I love it, it has a lovely ring to it and is definitely a looker. I can't stop playing it. Posted on 29/01/2016 by Dennis t Bought the guitar online arrived next day. Always fancied the hummingbird by Gibson but this is the best acoustic guitar I have played, Epiphone have made an excellent job of this guitar. Posted on 20/11/2015 by Gavlaaaaaa Just bought one of these after months of research and reading above average reviews. Stunning looks and solid build, reliable machine heads and strong woody tones. Plug it in and it only enhances the enjoyment. I have never owned a guitar that resonates and rings the notes so smoothly and for so long. I will say though, as with most guitars sold on factory set up, you will have to drop the action at the saddle - I took 1mm off for recommended string heights but I'm positive she'll go lower, and I put on a high quality set of 11's to replace the stock 12's that came with it. I found that the 12's didn't do the guitar justice and almost muffled the treble strings. Bottom line, she's a keeper!! Posted on 06/10/2015 by Ken P Best acoustic guitar I've ever played for the money, just can't put it down. Looks and feels very similar to the original Gibson model and I tried one at the Gibson factory in Memphis Sept 2015 just couldn't afford the Gibson guitar. Great finish, great sound, great price and plays great too. I give it 10 out of 10! You'd be lucky to find a better guitar anywhere for the money! Posted on 29/04/2015 by Ian H Bought this guitar last week in Chester store. What a bargain it's turned out to be. A really top notch instrument at a really reasonable price. The staff in the Chester store are really great, knowledgeable and incredibly helpful. The Guys suggested that I try 3 or 4 other guitars before making a final choice. Nothing was too much trouble. A really, really good shopping experience. Posted on 17/06/2014 by Tom T I recently bought my Hummingbird Pro and I cant fault this guitar in any way. It sounds great, looks great and you can just get lost playing it. I would recommend this guitar to anyone wanting to purchase a brilliant guitar for a brilliant price. Posted on 15/07/2013 by Baldy I've always loved the hummingbird- it looks great, plays better and sounds sweet. I had to 'settle' for an Epiphone, but it really is a lot of guitar for the money. It's still got the classic look, but there's a few compromises in its build compared to the Gibson. Well, it is about 1/10th of the price. Still, it sounds as good as any sub £250 guitar I've ever played (and that's a lot), and looks better than all of them. A real bargain in my book- more than happy with it. Posted on 09/06/2013 by James b Fantastic service from Chester dawsons store, the guy in the guitar department was very helpful. This is my first real acoustic guitar, after years of playing electric. I wanted to give it a go and not spend a lot of money. I was very impressed with the finish, quality and sound of the hummingbird pro. This guitar has it all at a great price and looks amazing.